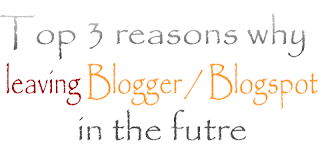 Home Blogging Poll: Your top 3 reasons why Leaving Blogger/Blosgpot in the future? 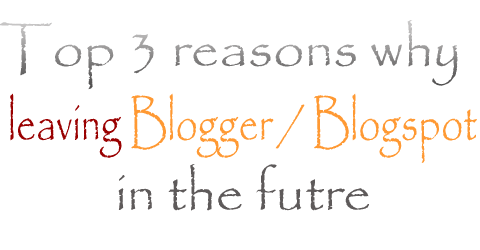 Poll: Your top 3 reasons why Leaving Blogger/Blosgpot in the future? For nearly a decade Blogger /Blogspot which was acquired by Google in 2003 has been the #1 choice of bloggers worldwide nowadays but it’s rival” Wordpress.org” is also dominating the web by powering over 50 millions blogs as of this year.The fact shows that those well-known and successful blogger nowadays are once a Blogspot user but opt wordpress.org in the long run .How come Blogger is only a training ground? Why those bloggers left blogspot and never come back? I know this issue has been brought countless times in the Internet but this moment, Bennixville want to gather some concrete data about why people leave Blogger / Blogspot when the time they've gained progress.By joining the poll below will helps a lot to tell.Who knows it might change or improve Blogger in the future by letting them know. Thanks a lot for your participation. Please share this post to many people especially to former Blogspot users and encourage them also to join the poll. Don’t forget to subscribe and leave your comment below.